If you are looking for a great egg incubator then this is the way to go. The Brinsea has a really durable construction that is sure to last for ages. It can fit up to 24 eggs and those eggs can be from a variety of different bird breeds. It’s a great incubator that has an automatic rotation feature to save you a bunch of trouble and it also has a preset temperature specifically set to be perfect for incubating eggs. 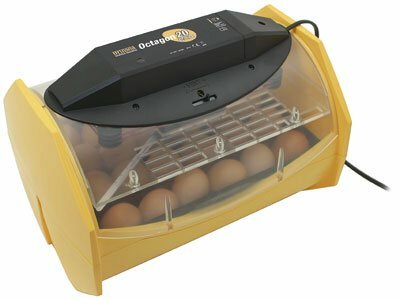 This incubator is great for a whole variety of eggs and it is one of the better models on the market today. Let’s talk about its features a little more. Auto Egg Turning – One of the best features of the Brinsea Incubator is that it has an automatic turning feature. Eggs need to be turned several times a day during incubation in order to survive. Not turning the eggs during incubation will result in the death of the embryos and this incubator takes care of that problem for you. Doesn’t Need Adjusting – Another really great feature about this particular incubator is that it is preset to the right temperature for incubating eggs. Eggs need a certain temperature to hatch properly, that being 99.5 degrees Fahrenheit. Other incubators need adjustments to be made in terms of temperature so that you don’t have to worry about setting the incubator to the wrong temperature because it has one preset setting and that is the right one. Durable – One of the best features when it comes to the Brinsea Egg Incubator is that it is made without the use of any toxic compounds and the foam has a really rugged construction which is non-thermal to ensure that the incubator remains at the proper temperature. This thing will survive if it is dropped on the ground by mistake so there is nothing to worry about there. The way that this incubator was built also makes it very easy to clean. Cleaning is an important part when it comes to incubating eggs which is just another reason as to why the Brinsea is the number one choice. Variety – Many egg incubators are built with a specific breed of bird in mind which is no good if you are looking to incubate more than one different type of egg. This incubator is built with variety in mind so that you can incubate as many different types of birds as you see fit. Energy Friendly – This particular incubator is built with the environment in mind because it was built to conserve as much energy as possible. If you are conscious about the environment then this incubator is definitely the way to go because it takes as little energy as possible. The double base makes this incubator preserve heat as much as possible in order to be well insulated and eco-friendly. Easy To Use – This is a really great incubator because it is very easy to set up and to use. All you need to do is to plug it in, put the eggs in it, put a bowl of water in the bottom, and you are ready to go. Easy To Clean – This model of incubator is fantastic because it doesn’t have too many parts, and all of the parts that are present have a very smooth surface. This means that it is very easy to clean before and after use to keep the eggs free of contaminants. Convenient – This incubator is very easy to use because the temperature doesn’t need to be set as it is already preset. It also has a fan assisted air circulation feature that keeps the air flowing and keeps them at an optimal temperature. Capacity – One of the only cons when it comes to this particular model of incubator is that it does have a limited capacity. Sure it can carry 24 eggs, but there are many people out there who want to incubate a lot more than that at once. Humidity – Another con when it comes to this incubator is that it doesn’t have any real way to control the moisture and humidity levels. There are no gauges to measure the humidity, something that is crucial when it comes to incubating eggs, which means that you need to get your own measuring tools. The Cord – One of the other drawbacks to this model is that it does have a relatively short power cord so it does need to be kept near an electrical outlet. The Brinsea is a fantastic option because it is strong, durable, built to last, and it does the job. It has a number of neat features like we discussed before, and based on the great price this incubator makes for one of the best choices on the market.